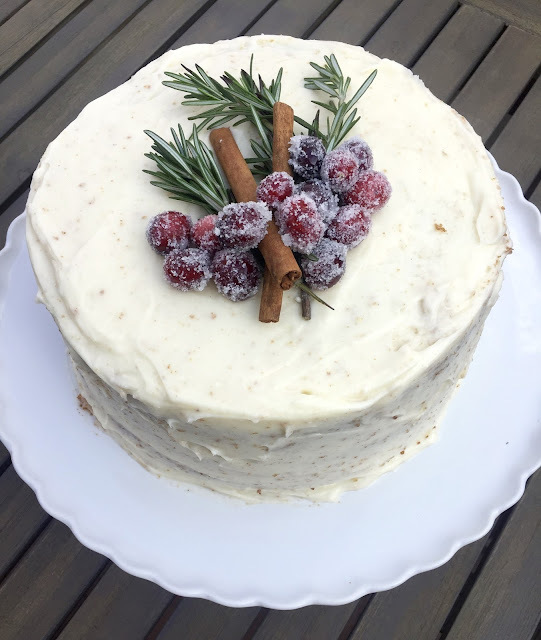 Even with Christmas over, you can always use a good winter cake recipe, am I right?! Well...this cake right here was a big hit this holiday season. It is filled with cinnamon and espresso, which gives it a great wintery flavor and don't even get me started on how moist (sorry...but it's true) it is. This cake will literally melt in your mouth. Don't forget the Mascarpone frosting, because that makes it! 1. Preheat the oven to 350° and grease three circular cake pans. Cut out three circles of parchment paper and place into the greased cake pans. Set aside. 2. In a large bowl whisk together the cake flour, espresso powder, cinnamon, baking powder, and salt. 3. Using a stand mixer on medium to high speed, cream the the butter and sugars together until fluffy. 4. Turn speed down to medium and add in the eggs, milk, and vanilla extract. 5. Scrape down the sides and then slowly add in the flour until completely combined. 6. Separate the batter into the three pans and cook in the preheated oven for 20-25 minutes or until a toothpick inserted into the middle comes out clean. Let cool for 10 minutes before removing from pan. 7. While the cakes are cooling, move onto the frosting. 1. Using an electric mixer, beat the mascarpone cheese and heavy cream together until combined and fluffy. 2. Add in the salt and slowly beat in the powdered sugar until you reach your desired consistency and sweetness. 1. Remove first cake layer from the pan and place on desired serving plate. Top with enough frosting to completely cover the cake, but leaving enough for the other layers and the top. 2. Place the second cake layer on top and cover with icing. 3. Repeat with the last layer and then cover the whole cake with the remaining frosting. Be careful, because the frosting does slightly pull on the cake creating more crumbs in the frosting! 4. For our topping, we first placed down some fresh rosemary, then topped that with two cinnamon sticks. 5. Then cover all that with some sugared cranberries and you are ready to go!